> fragment identifier like Link Fingerprints. > download managers. 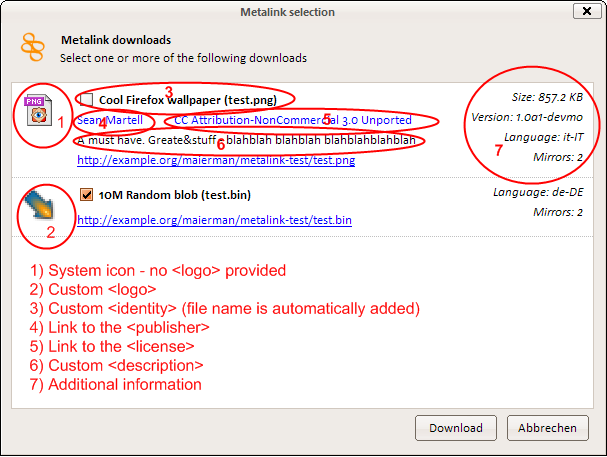 Around 21 programs have Metalink support. > into an IETF publication. > - Listing multiple mirrors for higher availability. > - Automatic error recovery and repair of corrupted downloads. > - Add a file or multiple files to a download queue. > - Share a library of files between filesharing applications. > - Simplified download pages. > <metalink version="3.0" generator="Metalink Editor version 1.0.0"
Previous message: Roy T. Fielding: "Re: Clarification of the term "deflate""
Maybe in reply to: Anthony Bryan: "Metalink: higher availability and self repairing downloads"